Low-cost carrier Zest Air offers a piso fare promo for the months of July to September 2013. The promo is open for all domestic destinations. And for those not familiar, Piso fare promo gives 1 peso of base fare but there's additional charges such as terminal fee, baggage (optional), fuel surcharges and other miscellaneous fees. Here's the promo poster for details. Tickets can be purchased at www.flyzest.com or at their nearest ticketing offices. 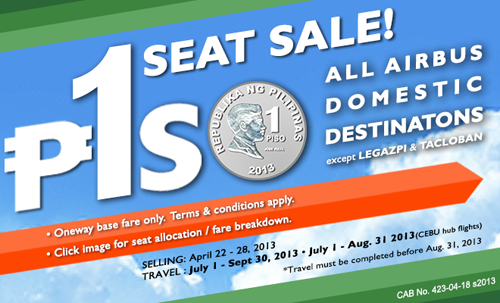 The promo is open for booking starting today until April 28, 2013, subject to flight availability. Zest Air is a Philippine-based low-cost airline and currently has operation in Manila and Cebu hubs. They offer both domestic and regional destinations. last month, AirAsia Philippines acquires 40% stake in Zest Air is a share swap deal.